Solar water heating in single family homes. Products used in this application are typically approximately 4 sq m. of collector with a 250-300 litre tank. Tanks are almost always mounted outdoors and some are installed in a thermosiphon configuration with the tank close coupled with the collectors, others are installed on the ground with forced circulation to the roof. Many tanks include auxiliary boosting within the tank using an electric element, others use a post heater, often inline gas fuelled, to provide backup for periods of insufficient solar input. Savings of 60% to 95% compared to a conventional gas or electric water heater are achieved. Solar pool heating. This typically uses unglazed thermoplastic collectors to provide improved comfort in outdoor pools or energy savings for indoor pools. The area of collector installed is generally 50% to 80% of the pool surface area. Solar water heating for domestic hot water has been driven by building and plumbing regulations that promote low emission water heaters. This varies from State to State. Low awareness of solar water heating and the tendency to replace ‘like for like’ in the replacement market remains a key barrier. Solar pool heating is driven by the high cost of using conventional energy to heat pools. 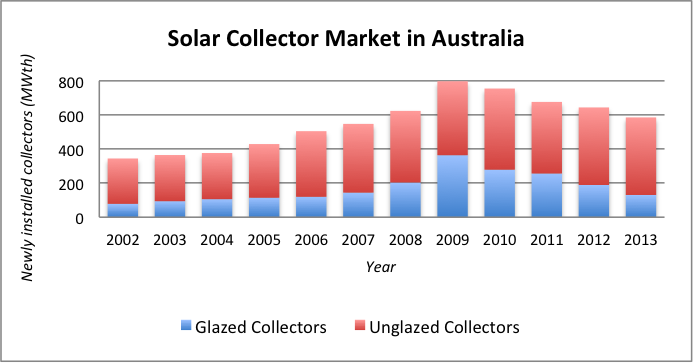 Australia has a large manufacturing base of solar water heaters and pool heating collectors. Some solar water heaters installed in Australia are imported. Some Australian products are exported. Most products are sold through specialist suppliers or conventional plumbing supply chains. Some specialist suppliers are franchisees of manufacturers but this is a small part of the current market. In new dwellings the builder generally provides the solar water heater which is often purchased from the manufacturer. Some solar water heaters installed in Australia have had issues with overheating in summer causing water loss due to boiling. AS/NZS 2712 was revised to include an overheating test to address this issue. In Australia there are a number of schemes that promote energy efficiency in buildings and also wider sustainability schemes. Whilst covered in the Building Code of Australia these are generally state based for domestic dwellings and generally only cover new buildings. Passive solar technologies including daylighting are not specifically recognised however the energy reductions contributed by these technologies help to reach energy consumption targets include in the schemes. There are a few industry leaders that are providing high levels of sustainability in buildings, however the mass market is producing regulation minimum buildings. There are no specific requirements or support for solar technologies for buildings other than solar water heaters. The main driver for residential dwellings is building regulations that are defined in the National Construction Code (Building Code of Australia and Plumbing Code of Australia) and implemented at state and territory level that require a minimum level of energy efficiency of the structure for new builds. This is measured at the planning stage using computer simulation programs to calculate heating and cooling energy loads from the plans, or through complying with other elements deemed to meet building regulations. Commercial buildings require disclosure of energy consumption at sale or lease which will influence property values. There is also a Green Building rating scheme, Green Star, which identifies good and best practice in new builds as a means of rewarding leading builds and developers. Many new CBD office buildings are achieving market recognition using Green Star. There are Green and White certificate trading schemes that are market drivers for existing residential and commercial buildings. These are limited in scope and apart from solar water heating no solar technologies are currently included in white certificate schemes. PV is included in Green Certificate schemes. While research on solar thermal and solar buildings is being undertaken by various institutions, there is not a single ‘national’ R&D program. The Australian Renewable Energy Agency (ARENA http://www.arena.gov.au/) maintains a research program for solar energy. ARENA has recently included industrial process heat as a prioritry area of research. Standards Australia Committee CS028 Standards body Solar hot water Solar cooling Task 43 Task 48 www.standards.org.au/? Market support innovations. SRES supports solar water heating by means of using computer simulations to calculate savings using an Australian and New Zealand Standard methodology (AS/NZS4234). The RET scheme is designed to ensure that 20 per cent of Australia’s electricity comes from renewable sources by 2020. The RET scheme is helping to transform Australia’s electricity generation mix to cleaner and more diverse sources and supporting growth and employment in the renewable energy sector. Since January 2011 the RET scheme has operated in two parts—the Small-scale Renewable Energy Scheme (SRES) and the Large-scale Renewable Energy Target (LRET). The LRET creates a financial incentive for the establishment or expansion of renewable energy power stations, such as wind and solar farms or hydro-electric power stations. It does this by legislating demand for Large-scale Generation Certificates (LGCs). One LGC can be created for each megawatt-hour of eligible renewable electricity produced by an accredited renewable power station. LGCs can be sold to entities (mainly electricity retailers) who surrender them annually to the Clean Energy Regulator to demonstrate their compliance with the RET scheme’s annual targets. The revenue earned by the power station for the sale of LGCs is additional to that received for the sale of the electricity generated. The LRET includes legislated annual targets which will require significant investment in new renewable energy generation capacity in coming years. The large-scale targets ramp up until 2020 when the target will be 33,000 gigawatt-hours of renewable electricity generation. This target has been reduced in 2015 from 41,000 gigawatt-hours. The SRES creates a financial incentive for households, small businesses and community groups to install eligible small-scale renewable energy systems such as solar water heaters, heat pumps, solar photovoltaic (PV) systems, small-scale wind systems, or small-scale hydro systems. It does this by legislating demand for Small-scale Technology Certificates (STCs). STCs are created for these systems at the time of installation, according to the amount of electricity they are expected to produce or displace in the future. For example, the SRES allows eligible solar PV systems to create, at the time of installation, STCs equivalent to 15 years of expected system output. investing in Australia’s energy future. The white paper acknowledges that Australia has abundant solar resources. It promotes technology neutral policies. It does not include heat. ARENA is an independent statutory authority which commenced operations on 1 July 2012, with two objectives: to improve the competitiveness of renewable energy technologies, and to increase the supply of renewable energy in Australia. The governance of ARENA is defined by the Australian Renewable Energy Agency Act 2011. ARENA has committed $1 billion to nearly 200 projects across a suite of renewable energy types. Industry has matched this investment with a further $1.8 billion, taking the investment in Australian renewables to a total of $2.8 billion as a result of the programme. More information on ARENA is available at: www.arena.gov.au. The $10 billion CEFC ($2 billion per year for five years) provides investment in renewable energy, low-emission energy technology and energy efficiency projects in Australia. The CEFC was established on 3 August 2012 under the Clean Energy Finance Corporation Act 2012. The CEFC commenced funding investments on 1 July 2013. As at 30 June 2014, the CEFC has contracted investments of over $900 million in projects with a total value of over $3 billion. In July 2009, the Council of Australian Governments (COAG) agreed to the comprehensive, 10-year National Strategy on Energy Efficiency (NSEE), to accelerate energy efficiency improvements and deliver cost-effective energy efficiency gains across all sectors of the Australian economy. The NSEE aims to streamline roles and responsibilities across government by providing a nationally consistent and coordinated approach to energy efficiency. The SRES creates a financial incentive for owners to install eligible small-scale installations such as solar water heaters, heat pumps, solar panel systems, small-scale wind systems, or small-scale hydro systems. It does this by legislating demand for Small-scale Technology Certificates (STCs). STCs are created for these installations according to the amount of electricity they produce or displace. Renewable Energy Target (RET)-liable entities have a legal requirement to buy STCs and surrender them on a quarterly basis. displaced by the solar water heater or heat pump, over the course of its lifetime of up to 10 years. This number may vary depending on geographic location, what kind of system is installed, Solar Credits eligibility, and/or the size and capacity of the installed system. There is a legal obligation on RET-liable entities (usually electricity retailers) to purchase and surrender a certain amount of these certificates each year. The trade in these certificates thereby provides financial incentive for investment in renewable energy power stations, and for the installation of solar water heaters, heat pumps, and small-scale solar panel, wind, and hydro systems. The certificates are created and traded through the Renewable Energy Certificate Registry, an Internet-based registry managed by the Clean Energy Regulator. supporting the update of resources like Your Energy Savings and Your Home that provide home builders, designers and the public with up-to-date information on how to improve the sustainability of their homes.